Gibson has unveiled the new B.B. King "Lucille" ES in Alpine White, a collaboration with the B.B. King Family Trust. Appointments on the striking limited-edition semi-hollow offering include a custom B.B. King “signature” engraved bridge pickup cover, brass “Lucille” engraved truss rod cover and “Crown” Mother of Pearl headstock inlay. True to King’s original specs and tone, the guitar boasts Gibson 490R and 490T humbuckers along with a Stereo Varitone setup. Other features include a TP-6 Fine Tune Tailpiece, Mother of Pearl Full Block inlays on a rounded “C” neck, gold hardware and Multi-ply Bound Tortoiseshell pickguard. “Throughout musical history, there has never been a guitar associated with one musician quite like blues legend B.B. King and his beloved Lucille,” said Cesar Gueikian, Chief Merchant Officer of Gibson. The new Lucille is being offered for $5,499. 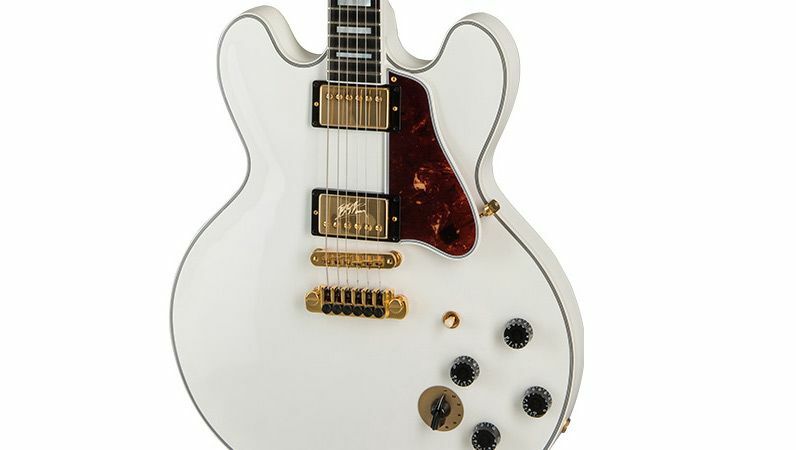 For more information, head over to Gibson.com.